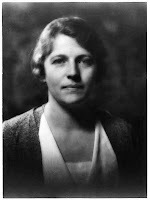 A few years ago I read Pearl S. Buck's autobiography My Several Worlds. * I was struck by the simplicity of her writing and the respectful and insightful way she chronicled the lives of people she encountered during her years in China. The daughter of missionary parents, she lived in China from infancy to young adulthood, speaking Chinese as fluently as she did English. Although her own life was turbulent and eventful enough to warrant an autobiography, it became more of a backdrop for a very engaging social history. I next wanted to read her Pulitzer Prize winning novel The Good Earth (M), and having finally gotten around to it, I wonder what took me so long. The story's sincerity and naturalness make it a new favourite. *- available by intralibrary loan. The Good Earth tells the story of Wang Lung and his family and their relationship with the land. Wang Lung was a young man impatient with his father's ways and eager to begin his life in earnest on the land and with a wife. O-lan, a slave, is deemed to be a sensible wife for him. She is plain and her feet were never bound and is considered to be a suitable help meet. They build their lives and family with back-breaking hard work. O-lan transforms what was a house into a home, and with her help, Wang Lung is able to become a successful farmer. Fortunes will rise and fall and Wang Lung must endure failure as drought destroys his fields and starvation forces the family from their land. Just when the family reaches their lowest point, determination and resourcefulness (and luck) restore them to their home and former prosperity. Wealth can bring its own problems and Wang Lung's happiness rises and falls as his family grows. Life being circular, in the end we see Wang Lung's sons impatient with his ways and pacifying him as he did his father. O-lan is silent and obedient and might seem down-trodden, but her strength and resilience is the backbone of this family. Wang Lungs knows this and respects her. Though he will not articulate it, he is proud of her. She saves them from starvation. She knows how to beg, and although Wang Lung has qualms about stealing, she will put the survival of her family first. Perhaps the most poignant moment of the novel is when Wang Lung brings the woman Lotus into their home and takes for her the two pearls O-lan has been saving for her daughter. Wang Lung is confused and dismayed by O-lan's sorrow but has no concept of why she would feel that way. Daughters were considered a pleasure in times of wealth, but a burden in lean times, a person to feed and clothe who would ultimately belong to another family. Wang Lung surprises himself with his compassion for his feeble daughter, caring for her personally for the duration of his life, always gentle with his "Poor Fool". One final thing that struck me (and then I'll stop because I could go on for some time) was the utter isolation from the world at large. Perhaps I am looking at this from a twenty first century perspective of instant information. Wang Lung is aware of his land, his family, his village and his cultural expectations, but nothing further. There is a certain timelessness about the book. There is nothing of the outside world to give context, but you assume that it is set in the early twentieth century about the time of the Boxer Rebellion. He had heard of wars throughout his life, and as a old man was curious to see a group of soldiers, but had no idea of why they were fighting. The Good Earth is also available through our eLibrary on Overdrive in both eBook and audio formats.